China is fretting and fuming over the visit of Tibetan spiritual leader the Dalai Lama to North-east India for participating in various functions in Assam and Arunachal Pradesh. What is wrong with Beijing? Nothing. Such Dragon-speak is a familiar spectacle for nations in the South China Sea region. Not for Indians, who are far removed from SCS. So much so the Beijing thunder may appear as out of the blue for them. You cannot find fault with the Chinese Foreign Ministry's spokesperson Hua Chunying for saying, "This (Dalai Lama's visit) will have serious damage on bilateral relations." Spokespersons anywhere have an unenviable job. And the Chinese points- person for the media is no exception. So are the leader writers in the official China Daily who are paid to indulge in word play and write that Beijing "would not hesitate to answer blows with blows" if the Indian authorities allowed the Dalai Lama to continue with his visit to Tawang et al. Take a close look at the Chinese outburst vis--vis the Dalai Lama's visit to Arunachal Pradesh. A very interesting pattern is discernible. Because Beijing is not unaware of the number of visits the Tibetan spiritual leader, who has been living in exile at Dharamsala tucked away in the Himachal Mountains, had made to Arunachal Pradesh in the past. Between March 1983 and 2009, he visited the area six times. On each trip he did not confine himself to Itanagar, the capital of Arunachal Pradesh. In fact, every time he was in the region, he made it a point to go to Tawang, the home to an ancient monastery. Put simply there is nothing extraordinary in his latest swing through Tawang. China is aware of this ground reality. Global Times conceded this much in a lengthy harangue, "India's use of Dalai Lama card tactless". "The 14th Dalai Lama started his visit to "Arunachal Pradesh" (South Tibet of China) on Tuesday. The Dalai Lama has been to the disputed region before, but what makes this trip different is that he is received and accompanied by India's Junior Home Minister Kiren Rijiju," the tabloid said editorially on April 6, 2017. In other words, China is upset not by the presence of Dalai Lama in 'South of Tibet'. Tawang is home to the Monpa people, who practice Tibetan Buddhism. My honourable Chinese comrades deserve a lesson in politics and democracy alike. Rijiju is a local politician, a son of the soil in a manner of speaking. He is a Buddhist by faith and practice. 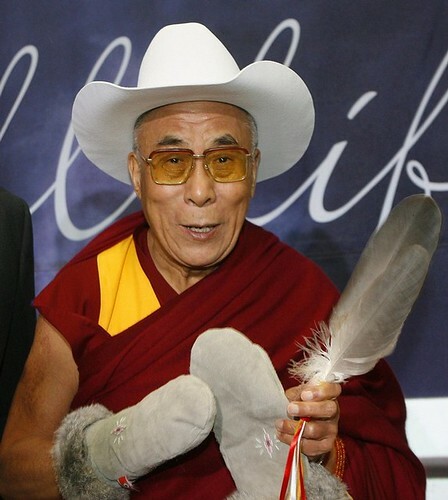 For any true Buddhist, he counts himself as one, Dalai Lama is no mere human being. For the likes of Rijiju, Dalai Lama is not a demon as Beijing wants the world to believe. He is the spiritual leader, believed to be a reincarnation of Avalokitesvara. And he does not come to their town and village every day. Everybody wants to see him, get his blessings, and touch his feet. They want to make the best use of the few hours he spends in their midst discoursing on peace and God. It is once in a life time experience. I am not holding a brief for India. Nor do I advocate the view that one should not see beyond the headlines. But to see something sinister in the Dalai Lama visit, as many officially authorised experts on the Chinese media, have done is an exercise in futility, an effort at searching for demons in a Church. Frankly, as Global Times notes, India has reasons to be 'strongly dissatisfied with the Chinese. One for not supporting its membership bid to the Nuclear Suppliers Group'. Two for not supporting India's bid to place Masood Azhar, head of Jaish-e-Muhammad (JeM), a Pakistani militant group, in the UN blacklist. To this list can be added Indian objections to China Pakistan Economic Corridor (CPEC) which China is building for Pakistan through the Kashmiri territory presently occupied by Pakistan. India has been publicly airing its displeasure over these Chinese actions. There is no secret about it. Nor is there is any secret of India's apprehensions over the string of pearls (Ports) China has built in the Indian Ocean, which Delhi rightly considers as its backyard.